Fritters had been on my list of things to make for a while before this, but I just never seemed to be able to find the time to make them. When I was invited to my first stage at SALT, the restaurant I now work at!, I was freaking out about it. I had never done a stage before; for those of you who do not know what that is, it is a working interview in a kitchen. The day before my stage, I looked over the SALT lunch menu and decided I would make anything that I hadn’t made before or thought I could use work on. I ended up making fritters and risotto and decided I could cook the rest of the things on the menu without practice. The funny part about this was that my stage did not involve hardly any cooking! I just made salads, made po’ boys and prepped food. I was so nervous for nothing! These fritters turned out great. I ended up using one of my mom’s fritter recipes, but used yellow tomatoes instead of red. The yellow tomato gave a bit of a tart flavor to the fritter. Fritters are fun because you can use your imagination and switch up the filling with whatever veggies or other foods you would like. If you are looking for a good starting recipe before making your own, this one is a great place to start. These are awesome served with ranch dressing. 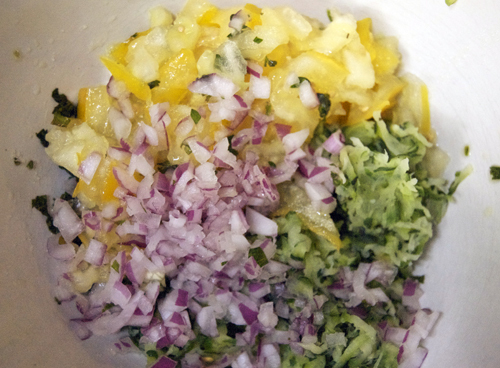 Combine tomatoes, zucchini, onion, parsley, basil, salt and pepper in a large bowl. Stir in the flour a little at a time until a thick batter is formed. Heat about 1 inch of frying oil in a large, shallow pot over medium high heat. Spoon about 3 tbsp of mixture into the oil and let the fritter fry until golden brown (about 3-5 minutes). Repeat with the rest of the mixture until it is all used. Serve with ranch dressing or other sauce of choice. Your picture is very tempting-there is no doubt that these taste amazing. I have bookmarked this and will be on the lookout for yellow tomatoes. Well done, yum! Your fritters look fantastic. I don’t know what a stage at a restaurant is, but it sounds like it would have been very nerve-wracking. Do you recommend the more tart flavor of yellow tomatoes or do you think the sweeter reds are better? Or, is it a matter of taste. Ya I had never heard of it either until then! I would say it honestly doesn’t matter, I used yellow because that is what I had. I don’t think you will really be able to taste the difference once they are fried. In the early the point of a stage has less to do with your cooking ability and more to do if the chef thinks you are trainable and how you interact with other employees. I guess you did fine since you now work there LOL. Where is SALT? These look amazing! I have never seen yellow tomatoes. I have so much zucchini right now. I am very happy to have a new, delicious recipe. These fritters look so tasty!!! I love that you used zucchini and yellow tomatoes too. I will def have to try! Wow – these are incredible! Zucchini and tomatoes? One of my favorite combos! Beautiful pictures, too! Can’t go wrong frying something healthy! I have some yellow tomatoes in the garden IF the weather would ever cooperate! Maybe somebody will have some next weekend at the market. These look too good not to try to make. 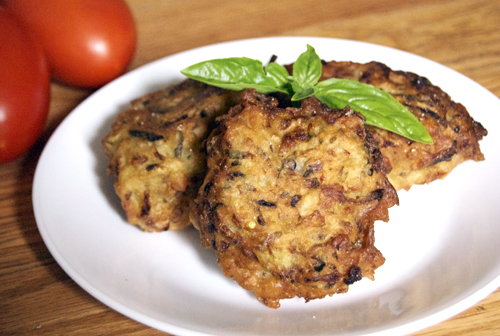 These fritters are fantastic… I especially like that combination of zucchini and tomato! 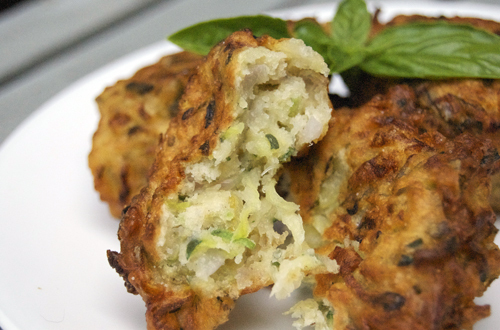 Zucchini fritters are like my all time fav evening snack. I never ate yellow tomatoes .. but do remember seeing those in an Indian store recently. awesome! i have a yellow tomato plant and a zucchini plant bombarding us with veggies. im going to try this one out! One more incredible and irresistible top 9!!! Congrats!!! 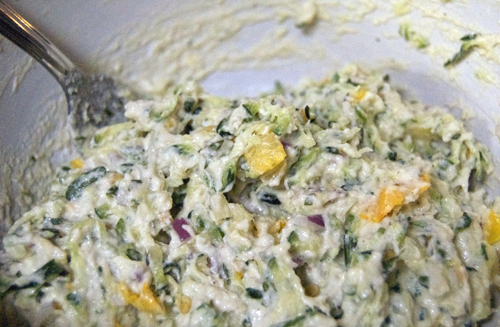 I have zucchini popping out of my garden…and can’t wait to try these! I love all the veggies in these. They must be relatively healthy for fritters. I’ve made zucchini fritters a few times, but I’ve never seen them with tomatoes added in before… sounds wonderful, especially since there seems to be no lack of ripe tomatoes or zucchinis at this time of year! 🙂 Must try these soon. Love the insight into the life of a chef wannabe! and the fritters look delicious. Not a fan of Ranch dressing, wondering what else might go well? These look great Jenny! I love fritters of any kind, and the fac that these have veggies in them make me feel less guilty too! These fritters look great! I have never had them before, but would love to have them for my dinner. Congrats on the new job! SALT in Boulder, CO? One of my favorite restaurants. These fritters look amazing. I have been doing a zuchinni and “whatever veg is in the fridge” pancake and this definitely steps it up a notch. Thank you for the inspiration! Yupp! Love the place, such great people to work with too! Mmmmmm, I haven had fritters in such a long time, good thing I came across your recipe, I have been inspired to cook! We skin and seed the tomatoes (red) and add a good bit of red pepper flake to the fritter batter, then top them with tomatoes roasted with garlic and olive oil to serve. Outstanding, hot or cold or left over. It’s probably fritter heresy, but we fry in just a little olive oil and Grandma’s 12 inch cast iron skillet. My zucchinis are plump and healthy at the moment and my large crop of tomatoes are just starting to ripen, so I can’t wait to try out this recipe! And I’ve still got some parsley in the garden. Looks delicious! So jealous! We are in the middle of winter here! BRR!